John Roberts has been named to guide the storied El Camino football program. John Roberts, offensive coordinator at St. Augustine, has been named head football coach at El Camino High. Roberts is just the fourth football coach at the school since it opened in 1975. “I’ve been preparing for this opportunity for a long time,” Roberts said. 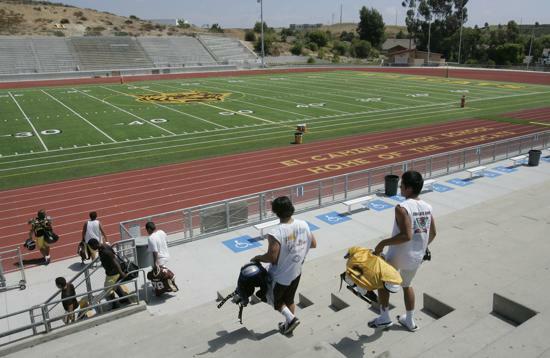 “El Camino has a very diverse group. It’s a strong academic school and the players are hungry to win. Roberts, 34, grew up in San Diego and attended University High, playing his senior season under coach Sean Doyle. 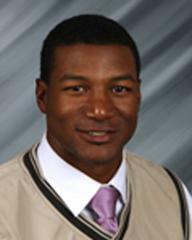 Roberts played four seasons at Utah State as a running back. El Camino had 41 applicants for the job formerly held by Pulu Poumele, who was 21-25 in four seasons. The Wildcats own eight San Diego Section titles, all under legendary coach Herb Meyer. The selection committee interviewed seven of the 41 applicants. “The panel would have been happy with any one of the final four,” said El Camino Athletic Director Sean Helgesen. “But John Roberts stood out. “All the candidates can coach football, but John has a great personality. He’s engaging. “He was very prepared for the interview. He researched El Camino High. He was organized, prepared. He has a plan. “He doesn’t have a five-year plan to build a program. He wants to win now. Roberts’ offenses at St. Augustine routinely averaged 30-plus points a game. The Saints won the section Division II championship last season, defeating Mission Bay 49-0 in the title game. Roberts runs a pro-style offense — one back, a tight end and three receivers. “But we’ll base what we do on the talent,” he said. On defense, Roberts plans to slant and blitz, mixing up coverages. “We’ll do as much as the talent allows,” Roberts said. Roberts, who teaches math, will be an on-campus teacher. He plans to meet the public at 6 p.m. Tuesday in an event at the El Camino campus. Spring ball is planned for the final three weeks of May.